The esophagus is the tube that carries food from your mouth to your stomach. If your child has reflux, his or her stomach contents come back up into the esophagus. Another name for reflux is gastroesophageal reflux (GER). GERD stands for gastroesophageal reflux disease. It is a more serious and long-lasting type of reflux. If your child has reflux more than twice a week for a few weeks, it could be GERD. 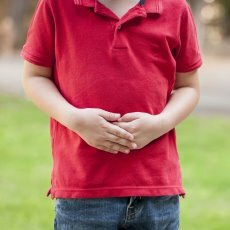 What causes reflux and GERD in children? There is a muscle (the lower esophageal sphincter) that acts as a valve between the esophagus and stomach. When your child swallows, this muscle relaxes to let food pass from the esophagus to the stomach. This muscle normally stays closed, so the stomach contents don't flow back into the esophagus. How common are reflux and GERD in children? Many children have occasional reflux. GERD is not as common; up to 25 percent of children have symptoms of GERD. What are the symptoms of reflux and GERD in children? Your child might not even notice reflux. But some children taste food or stomach acid at the back of the mouth. Heartburn, a painful, burning feeling in the middle of the chest. It is more common in older children (12 years and up). How do doctors diagnose reflux and GERD in children? In most cases, a doctor diagnoses reflux by reviewing your child's symptoms and medical history. If the symptoms do not get better with lifestyle changes and anti-reflux medicines, your child may need testing to check for GERD or other problems. Upper GI series, which looks at the shape of your child's upper GI (gastrointestinal) tract. You child will drink a contrast liquid called barium. For young children, the barium is mixed in with a bottle or other food. The health care professional will take several x-rays of your child to track the barium as it goes through the esophagus and stomach. Esophageal pH and impedance monitoring, which measures the amount of acid or liquid in your child's esophagus. A doctor or nurse places a thin flexible tube through your child's nose into the stomach. The end of the tube in the esophagus measures when and how much acid comes back up into the esophagus. The other end of the tube attaches to a monitor that records the measurements. Your child will wear the tube for 24 hours. He or she may need to stay in the hospital during the test. Upper gastrointestinal (GI) endoscopy and biopsy, which uses an endoscope, a long, flexible tube with a light and camera at the end of it. The doctor runs the endoscope down your child's esophagus, stomach, and first part of the small intestine. While looking at the pictures from the endoscope, the doctor may also take tissue samples (biopsy). What lifestyle changes can help treat my child's reflux or GERD? Sleeping at a slight angle. Raise the head of your child's bed 6 to 8 inches by safely putting blocks under the bedposts. What treatments might the doctor give for my child's GERD? If changes at home do not help enough, the doctor may recommend medicines to treat GERD. The medicines work by lowering the amount of acid in your child's stomach. If these don't help and your child still has severe symptoms, then surgery might be an option. A pediatric gastroenterologist, a doctor who treats children who have digestive diseases, would do the surgery. Article: Pre-operative gastric ultrasound - should we look inside Schrödinger's gut?